This week Sterg and Derek check out three intriguing, yet very different, titles. They begin with Nicky Wheeler-Nicholson’s DC Comics before Superman: Major Malcolm Wheeler-Nicholson’s Pulp Comics (Hermes Press). This is a collection of comics written or inspired by the writing of Major Malcolm Wheeler-Nicholson and an overview of the pre-Superman history of the publisher. After that they look at Ed Brubaker and Sean Phillips’s My Heroes Have Always Been Junkies (Image Comics), the latest noir narrative in their Criminal series. And then the guys wrap up with Umbrella Academy: Hotel Oblivion #1, Gerard Way and Gabriel Bá’s return to their Umbrella Academy world. Long-time Vertigo Comics fan and my good friend Travis joins me again for a lively discussion about DC Comic’s and Gerard Way’s Young Animal imprint. This episode, we discuss Shade, the Changing Girl (1-3) and Mother Panic (1-2), plus the backup features. If you haven’t already, please listen to episode 110 where we discussed Doom Patrol and Cave Carson Has a Cybernetic Eye. Comic book round table. This week, we have – Justice League Darkseid Special #1, Black Panther #1, Empress #1, Superman #51, Poe Dameron #1, Interview with Scott Koblish and more ……….. The Book of the Month for January 2011 is none other than The Umbrella Academy: Dallas (Dark Horse) written by Gerard Way with art by Gabriel Ba. Past, present, or future; the Umbrella Academy is on the case! Read the written review here! The Book of the Month for January 2010 is none other than The Umbrella Academy: Apocalypse Suite (Dark Horse) written by Gerard Way with art by Gabriel Ba. In my personal opinion; the perfect comic book. Read the written review here! Totally radical week for comics! Pick of the week goes to Gerard Way and Gabriel Ba for The Umbrella Academy: Dallas #6 (Dark Horse). Fast Five picks include Green Lantern Corps #36 (DC), The Walking Dead #61 (Image), Deadpool: Suicide Kings #2 (Marvel), Fables #84 (Vertigo), and Secret Six #9 (DC). Thanks again to Rising Sun Creations for sponsoring the contest this episode! In this episode, the guys take an Easter-inspired superhero quiz. Mark shares how he would prepare to audition for Spider-Man on Broadway. Eight comics are reviewed in eight minutes, including Days of Future Past, which Nick just now read. All that, and Jason’s there, too. What a wonderful week for comics! 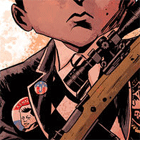 Pick of the week goes to Gerard Way and Gabriel Ba for The Umbrella Academy: Dallas #4 (Dark Horse). Fast Five picks include Avengers: The Initiative #22 (Marvel), Doctor Who: The Whispering Gallery (IDW), Green Lantern #38 (DC), Nova #22 (Marvel), and The Sword #15 (Image). This week had so many winners, I could have easily done another episode of just Fast Fives. The Doctor, Seance, and the Nova Corps make this week absolutely wonderful! Whatta show! From Gerard Way and Gabriel Ba comes The Umbrella Academy: Dallas #3 (Dark Horse). Fast Five picks include Batman #685 (DC), Nova #21 (Marvel), Battlefields: Dear Billy #1 (Dynamite Entertainment), Blue Beetle #35 (DC), and New Avengers #49 (Marvel). Hazel and Cha-Cha, Ego the Living Planet, and Khaji-Da make this week fantastic!